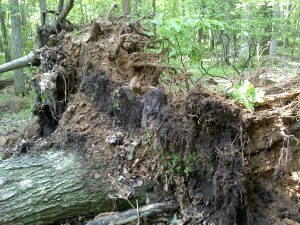 In my short story, “Uprooted,” there is a magnificent thunder storm that causes a tree to become uprooted in the woods behind the main character’s house. Last night, I experienced a storm close to the magnitude I had previously written about. 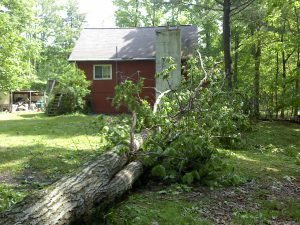 We lost electricity and the high winds whipped around the treetops, tearing branches and leaves free. Moments later, I heard a creaking, followed by moaning, followed by an earthshaking crash. 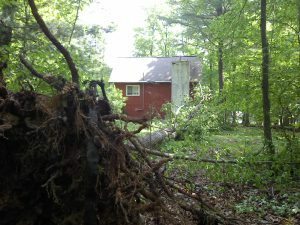 As in my story, a tree in my very own backyard had become uprooted. Unlike the story however, this tree fell across my backyard, coming within mere yards of crashing into the house. 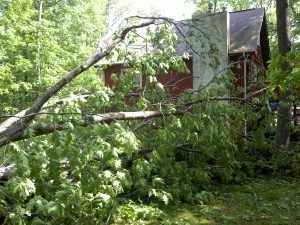 The eeriness of experiencing an event so like something I have written was exceeded only by the knowledge that my house could have been crushed, had the tree been any closer. Stay tuned for a special Memorial Weekend contest!